Visual motion perception plays an important role and meaning in experiencing a space through a process describing how identification can be made by a visual system in order to transfer 2-D information to 3-D interpretation. Through the case studies of ‘Moving Lights’ by Johansson, ‘Boundary Functions’ by Snibbe and ‘Marling’ by Haque, and through 1:1 scale physical model experiments, visual motion perception is explained as a medium which provides possibilities to experience this interactive virtual space created with the use of laser sources. What is the fundamental process of the visual system which makes it possible to perceive compelling space? Which key visual motion perception phenomena can be utilised in the creation of an engaging virtual interactive installation using simple projected lines? What is the most adaptable technological design solution in attempting to create such phenomena? Figure 1. The view outside a window. It is easy to perceive gliding birds and stationary buildings but difficult to perceive the slow movement of clouds. 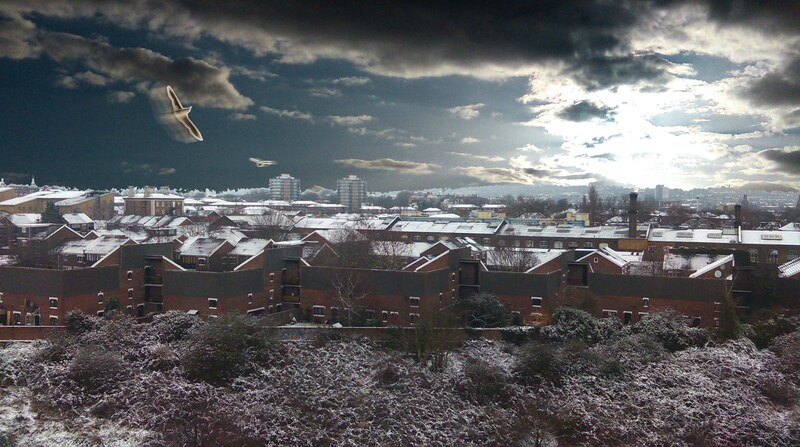 When an individual is standing in front of a window looking outside (Figure 1), perceptually the buildings could be seen as quite stationary, the birds gliding smoothly with their wings flapping and it may be difficult to realise the sluggish movement of clouds. To distinguish not only the shape, colour, size and texture, but also the state of motion of objects, all animals use the eyes to get direct input information from their surrounding medium. How, then, is the physical world transformed by our eyes as we see, especially in the case of a moving object? Our eyes can identify moving objects from the stationary background and help us to build up simple images on the retina, then transformed into three-dimensional projections. Therefore, the study of the visual motion perception of the visual system may be the foundation for the individual to experience the three-dimensional space. 2. ESSENTIAL REVIEWS OF VISUAL SYSTEM. From the point of view of neural and psychological science, there are two essential reviews important to underline: two cortical pathways and light flux impinging and optical flow. Neural review: two cortical pathways. There are two separate visual pathways for perception and action. Schneider (1969) made the assumption that visual information could be encoded between the identification of a stimulus and the location of the stimulus. This hypothesis has remained in use distinguishing between the “what” and “where” of the visual perception system. For example, according to Ungerleider and Mishkin (1982), in order to perceive the recognition of objects and the movement signals of objects, different kinds of visual information can be processed separately in the inferior temporal and posterior parietal cortex (Figure 2). The former is customarily called the ventrally stream and the latter the dorsal stream. Figure 2. Ventral and dorsal streams. The motion processing stream is a part of the dorsal stream. Besides these two general streams in the brain to process visual information, the motion processing stream is a fascinating pathway to consider. It is a part of the “where” pathway system but shares functions of both the ventral stream and the dorsal stream. According to Andersen (1997), it means that not only can it analyse motion stimulus to perceive the complex quality of objects, but it also takes responsibility for transforming visual motion signals to the visual-motor system. The latter includes visual information for planning, spatial awareness and decision making. Therefore, this stream is the foundation of visual motion perception in the neural science analysis. Light flux impinging and optical flow. The original stimulus which triggers the brain mechanisms for visual motion analysis is the luminous flux. The luminous flux is a measurement of the perceived power of light which accounts for the sensitivity of the eye at each wavelength. Our eyes have a similar function as the camera that can focus on light rays to produce a two-dimensional image on the surface of the retina. 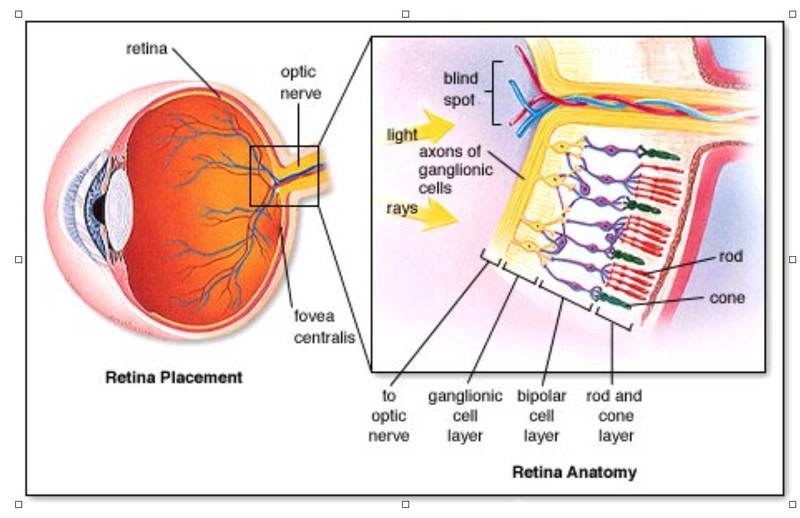 Retina receptors are located at the back of retina. They consist of two types of cells, the rods and the cones which have different abilities to absorb light impinging (Figure 3). Retina receptors have the ability to receive photons as lens; however, their real ability is not to receive photos and make 2-D image but to analyse changes in luminous flux constantly. Figure 3. The rods and the cones absorb light impinging. According to Johansson (1975), when retina receptors are stimulated by light impinging, the structure of photosensitive molecules will change. This kind of change can trigger a flow of ions released in the receptors (the rods and the cones), generating a bioelectric signal. As Johansson (1975) points out, it is worth noting that the strength of the signal which will be sent to the nerve cells is adjusted by the variation of light flux. In a very short time, the light flux stimulus will go through a complicated neural network with the retina itself and finally arrive at the cerebral cortex. What we constantly obtain is the motion of perception in visual space. As such, if there is no stimulus by light flux, the neural network will be useless and the perception of motion will disappear. Therefore, it is necessary to understand the initial input of raw material of sight, which helps to explain the beginning of how the viewer sees the world through the visual system. The optical flow is the pattern used to describe the relative motion between the viewer and the scene (Gibson, 1950). In the course of the relative movement it keeps acting on the retina. The optical flow was first proposed by Gibson (1940) and is used to describe how moving animals feel the visual stimulation. 3. 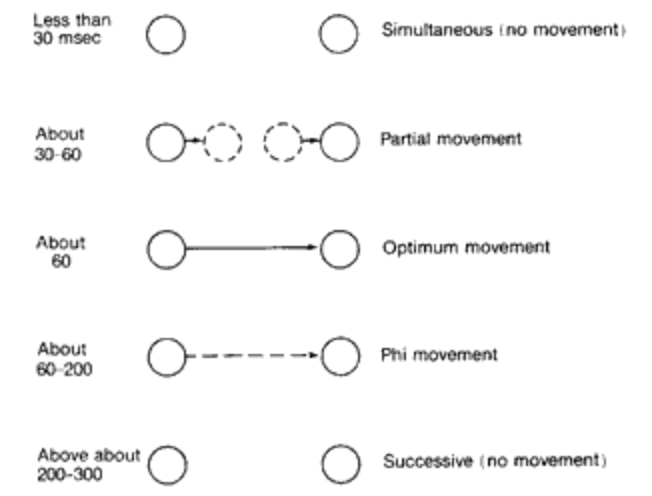 KEY PHENOMENONS OF VISUAL MOTION PERCEPTION. Definition of visual motion and the correspondence process. Ullman (1979) indicated that based on the changing images reaching the eye, visual motion is a process which describes the environment in terms of the appearance of objects, their structure of 3-D shape and the motion pattern created through space. Jules of the ‘AT&T Bell Laboratories’ and Braddick of University of Cambridge (1986), stated that in order to perceive an intermittently visible object as being in continuous motion, the visual system must above all detect what is called ‘correspondence’. From a psychological point of view, in order to perceive the visual motion, correspondence tokens need to find a proper connection to generate correlation to match them. This matching process is called the ‘correspondence process’ and could be understood as a communication process between the elements received by our visual system. Using a daily experience to explain it, when a viewer stares at a computer screen and the computer screen is flashing still images at the rate about 20-30 per second, this does not look like still images but looks like motion. However, there is no actual motion there. This constitutes the so-called ‘apparent motion’. To think about the experience of playing with a flipbook, noticing that between each picture vision is briefly interrupted by the turning of the previous page, which essentially means that the images are being turned on and off. This on and off is the key to understanding how apparent motion works. Figure 4. Different time intervals produced different perceptions. Two flashing spots turn on and off consecutively as seen in Figure 4. With different time intervals between them, different perceptions will be achieved as shown in the figure below. In apparent motion, the stimulus does not move continuously across retina. When the time interval is between 30-60 msec (Figure 4), the perception is like serial spots which move from the left side to the right side. Figure 5. The wagon wheel phenomenon. There is a well-known motion effect phenomenon called the ‘Wagon Wheel’, also named as ‘Broken Wheel’. It is an example of the phenomenon of apparent motion. When the wheel pattern moves at the appropriate rotational speed, it gives out the perception that it rotates differently from its true rotation. The visual system has the ability to select the images received by the eyes. One way is that each of the correspondence tokens is seen as a structured form and the correspondence process is established between these integrated forms (Figure 5). Marling by Usman Haque (2012). ‘Marling’ (2012) by Haque operates as a valuable example that demonstrates the experience of the ‘apparent motion’ phenomenon. Marling is a mass-participation interactive urban spectacle, sited in a public square in Eindhoven, Netherlands, brought to life by the voices of the public. It uses the phenomena of apparent motion vividly. It utilises laser projectors, through interaction with the sounds of participants, creating endless variations of unforeseen appealing visual senses with simple projected lines. This design uses multiple projectors to project 2-D patterns simultaneously. Therefore, with the smoke machines working in the environment, these projectors can create a changing creative 3-D visual effect. All of the patterns are created by simple lines. The lines changes position with different speeds which depend on the volume of the voice. From an observer’s point of view, according to the changes of the volume and the tone of voice, the 3-D visual space changes at the same time. That is how the result of a compelling space comes about (Figure 6). Through auditory perception and visual motion perception working together, marling makes participants perceive a creative virtual 3-D space. As Ullman (1979) perceptively states, there is a built-in similarity metric to govern this token pairing process, called affinity. The motion correspondence happens when the pairing tokens are arranged in direct order. Various similar parameters are considered between the pairing tokens before they pair together. Figure 6. Distance differences affect the affinity. As shown in Figure 6, two dotted lines are located on both sides of one solid line. They have the same length, colour, and direction. When the solid line is represented first and then replaced by the dotted lines, two same motions from the solid line to the dotted lines appear at the same time. The solid line will split and take part in motions on both sides. However, if the distance changes, only the shorter distance side of the motion perceived increases, until a point at which the longer distance side motion cannot be perceived. This preference illustrates that the visual system operates an affinity bridge between pairing tokens. This built-in similarity metric is expected to be an atomic operation underlying the correspondence process. The parameters that affect the affinity include many elements, such as distance, length, orientation, colours, etc. In this section, distance plays an important role acting on affinity apparently. Boundary Functions by Snibbe (1998). This is a real-time visual motion representation which illustrates the impact of human visual motion perception. It helps understand affinity and distance phenomena when the projected lines change with the participants’ position. It consists of four main parts; a projector and camera fixed on the ceiling, computer programming and a retroreflective surface on the ground (Figure 9). The image projected by the projector is single connecting lines which are based on the principle of Voronoi diagrams. When people walk on the panel, lines which are interactive with the people are projected by the overhead projector. The viewer moves by seeing the change in the boundary lines. At the same time, these lines also indirectly reflect the relationship between people which describe each individual ownership of their virtual space. This project takes advantage of the ability of the visual system to process 2D images in motion. Observers change their position according to the fast change projected lines. Imagine that if the observer has a particular desire to possess the space, or likes to experience meditation, they will observe the changing lines of the boundary very carefully. During this process the visual motion perception plays a key role. One can also assume that if the observer is conscious of the correspondence process, the participants may be able to find changes in the law as soon as possible and make early judgments in order to occupy a larger space. Figure 7. An example of kinetic depth effect. A perceived cylinder is created by a mounts of moving dots. This phenomenon was first observed by Wallach and O’Connell (1953) through their experiments. At that time, they termed it the “kinetic depth effect” (KDE). According to Wallach and O’Connell (1953), Green (1961) and Johansson (1974) the visual system can interpret a 3-D structure with unconnected information in motion. 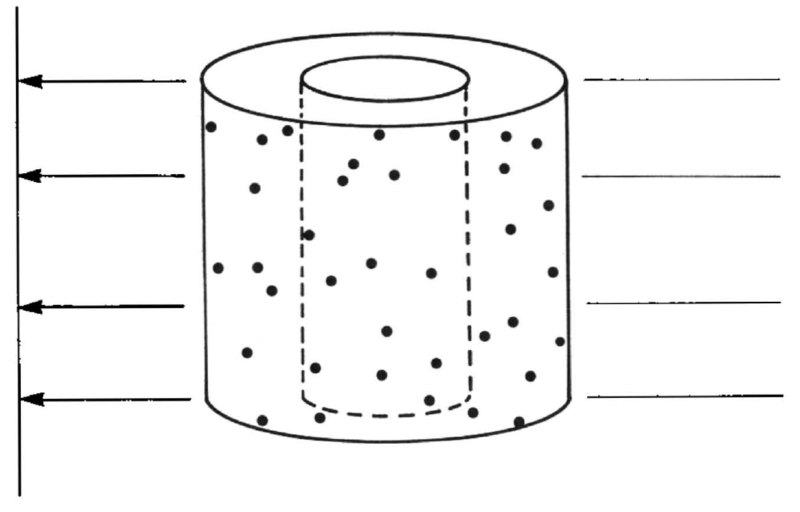 In Figure 7, imagine that there is a mound of black dots on the surface of two transparent glass cylinders. When these two cylinders rotate looking at the front elevation, there will just be lots of messy dots of different density at the two edges. Or if they are still, just lots of static dots can be seen. However, when changing to another view and rotating, two 3-D shapes of the cylinder can be perceived immediately. This experiment illustrates two points. The first is as the static view has no 3-D information, the interpretation of the 3-D structure can only be formed in motion. The second point is that familiarity is not necessary for the interpretation process because each single view is an unfamiliar presentation. To sum up, this process has the ability for the recovery of 3-D spatial motion from non 3-D information views. The perception of space in motion is traditionally divided into 2D and 3D perception. The difference between them is that three dimensional perception has a depth dimension. According to Johansson’s early experiments, if a point accompanied with a change in depth moves horizontally on the computer screen, the most direct perception is still perceived as a 2-D movement. If the point moves in an elliptic trajectory on the screen, then there may be felt as a plane of motion or a 3D circular path. If you use a line instead of a point to move a horizontal movement with no length change, then this line will certainly be perceived in the 2D plane motion. If this line is accompanied by a change of length, then it is clear to determine that it moves in the depth of a 3D motion. When it moves in an elliptic trajectory with the change of length, a cylinder can be perceived as the theory of structure from motion. With the further research, three key phenomena were paid close attention to. Here, these three key effects will be used in the mechanism design of the interactive installation “Orbital thresholds”. For further project information, please see ‘Orbital thresholds’. A set of ‘KINETIC INSTALLATION EXPERIMENTS’ about visual motion perception will be post later. Absolutely insightful. Enjoyed this post. Many thanks!